Check how many ingredients there are in total — the less ingredients listed, the more natural and close to it’s whole form the product likely is. Also check the names of the ingredients, if there are any complicated, unfamiliar names (things that you don’t recognize as food), and in particular, if there are any ingredients that sounds more like chemistry projects, it’s a red flag that that product is highly processed and/or refined. Companies love to masquerade their sugars under alternate names. Some hidden sugar names to watch out for: anything ending in ‘ose’ (glucose, fructose, dextrose, sucrose, lactose, maltose etc. ), agave, barley malt, brown rice syrup, cane (sugar, juice, crystals, solids etc. ), caramel, ethyl maltol, dextran, carob syrup, fruit juice, corn syrup, high fructose corn syrup (or HFCS), and any name that includes sugar in it. Ingredients are listed in order of weight (signifying quantity), so you want the healthy ingredients at the top, and anything unhealthy should be further down the line. If the first three ingredients include anything unhealthy, avoid that food. Finally, be aware that some companies will try to trick you by adding multiple varieties of an unhealthy ingredients such as sugar, in order to push those ingredients further down the ingredients list so that you think the total amount is less than it actually is. Companies love to include the words “whole” and “multi-grain” on their labels, especially for breakfast cereals, pastas, breads and crackers but it doesn’t necessarily mean the product is made primarily with wholegrains. Check the ingredients list and make sure the wholegrain is listed as the first ingredient (avoid anything with the word enriched in front of it which means it’s been stripped of it’s fibrous bran). Finally, check the fibre content under the nutrition facts panel — real wholegrain products should contain at least 3 grams of fibre per serving. 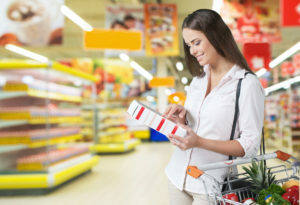 Scan the ingredients list and avoid products with artificial colourings, flavourings, additives such as sodium benzoate, partially hydrogenated oils (trans fats), nitrates and nitrites; artificial sweeteners (aspartame, acesulfame, sucralose, saccharin etc. ), and anything that has MSG in it (sometimes hidden as yeast extract, textured vegetable protein, or hydrolyzed vegetable protein). The type and not the total amount of fat grams is what’s important — if there is any trans fat avoid that product. Conversely, if the fats come primarily from healthy unsaturated fats (monounsaturated or polyunsaturated) you’re probably good to go. Saturated fats are a bit less black and white, your brain and body require saturated fats for optimal health but they should ideally come from natural sources such as avocados, nuts, organic butter and coconut oil and not from packaged foods. Additional Tidbits: Take note of the sodium content (your total daily intake shouldn’t exceed 2,300 mg) and check the serving size (most of us eat more than just one serving at a time). Finally don’t be fooled by gimmicky statements such as ‘fat-free,’ ‘all natural,’ ‘sugar-free,’ ‘no-sugar added,’ ‘light,’ ‘zero tans fats,’ ‘gluten-free,’ or ‘made with real fruit’ — companies slap these terms on their products to fool you into thinking that their product is healthy, but the only way to know the true health value is to examine the nutrition and ingredients labels on the back.